Established in 1923, Texas Tech University is located in Lubbock, TX, with an enrollment of 36,000 students. The university offers degrees in more than 150 courses of study through 13 colleges and hosts 60 research centers and institutes. Beginning in 1969 as Texas Tech University School of Medicine, today The Texas Tech University Health Sciences Center (TTUHSC) is a seven-school university located in Abilene, Amarillo, Dallas/Fort Worth, El Paso, Lubbock, Midland and Odessa. TTUHSC has trained more than 10,000 health care professionals, and meets the health care needs of more than 2.5 million people who live throughout a vast 108-county area stretching from the Texas Panhandle south to the Basin and west into Eastern New Mexico. TTUHSC manages a 150 vehicle fleet. Fleet management includes processing reported expenses, managing regular inspections and maintenance. Additionally, it is necessary to keep track of all information regarding the usage of vehicles, including how many gallons of fuel were used, how many miles were driven and how many people were in the vehicle at any given time. Previously, this process involved a lot of paper. It was difficult to keep track of all the receipts associated with each vehicle. Vehicle coordinators had to check the paper receipts against credit card statements by hand, resulting in an error prone and cumbersome process. 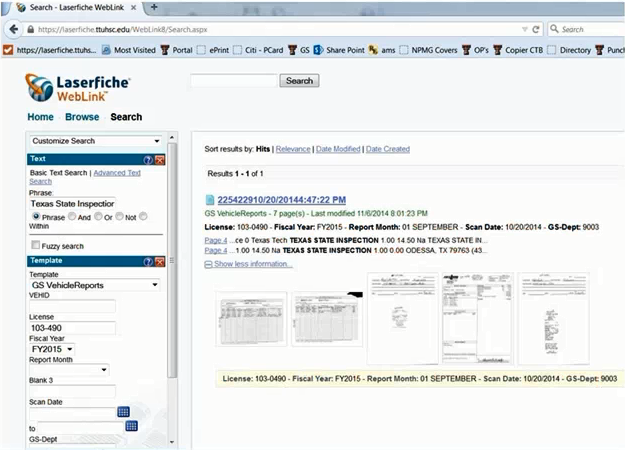 Here is how Laserfiche helped the TTUHSC manage its fleet without any paper. Vehicle coordinators manage the TTUHSC fleet through a custom fleet management web portal. From here, vehicle coordinators and custodians can upload or enter new records or documents, and run reports. A vehicle coordinator can see all of the vehicles, but each vehicle custodian sees only his or her vehicle. Every vehicle is assigned its own credit card called a Voyager card. All the charges related to the vehicle are charged to that card. At the end of the month, these expenses must be matched up to valid receipts and uploaded to a state system. Every month, the credit card company sends the TTUHSC a CSV file of charges. The vehicle coordinator uploads this file to a server. 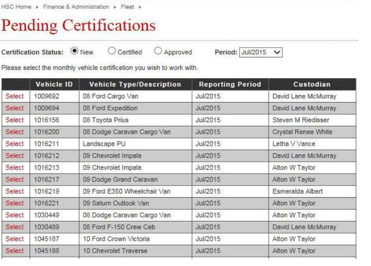 The vehicle custodians log into the portal and find their vehicle. When they select it, they can see a list of all credit card expenses associated with that vehicle. 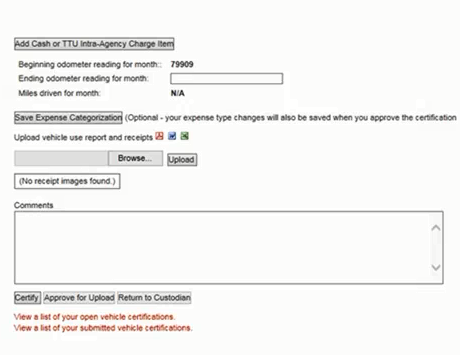 The vehicle custodians click on an expense and scan in the associated receipts and logs. OCR is performed on the receipts as soon as they are scanned in. A custom module matches the expenses in the receipts against the itemized expenses in the CSV file. The items without a match must be matched up by the vehicle custodian manually. He can also add any expenses that were not charged to the credit card. 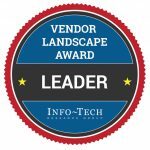 Once the information is submitted and scanned in, Laserfiche Workflow populates all the metadata fields with the transaction data including vehicle ID, date, location, mileage and custodian name. A vehicle custodian or coordinator can now perform a text search in Laserfiche WebLink to find the last state inspection, oil change, etc. Instead of mailing physical copies to the vehicle coordinator for processing, vehicle custodians can scan in receipts from any location, saving on postage and eliminating the potential for lost documents. Receipts are matched against credit card statements automatically, saving time and increasing efficiency. A vehicle coordinator or custodian can quickly find any maintenance record for a particular vehicle with just a simple keyword text search, instead of sorting through boxes of paperwork.